Founded in 43 BC by the Romans, Lyon is located in 470km south of Pairs in the Rhône-Alpes region close to Geneva and the mountainous French Alps. It is a great weekend destination if you like ancient history, relaxed French culture, sporting events, festivals, delicious cuisine and incredible wines. Lyon has developed a reputation as the capital of gastronomy in France. This is due in part to the presence of many fine French chefs (e.g. Paul Bocouse) and the fact that the famous wine growing regions of Beaujolais and Cotes du Rhone surround Lyon in the north and south. The city of Lyon (population 480,000) is broken up into 9 arrondissements which sit either side of the River Saône and River Rhône. The two rivers join in a “Y” shape and form the famous Presqu’ile (peninsula). From 1998 the arrondissements Fourvière, Vieux Lyon, Croix-Rousse and a large part of Presqu’île have been classified as a part of an impressive UNESCO World Heritage site. 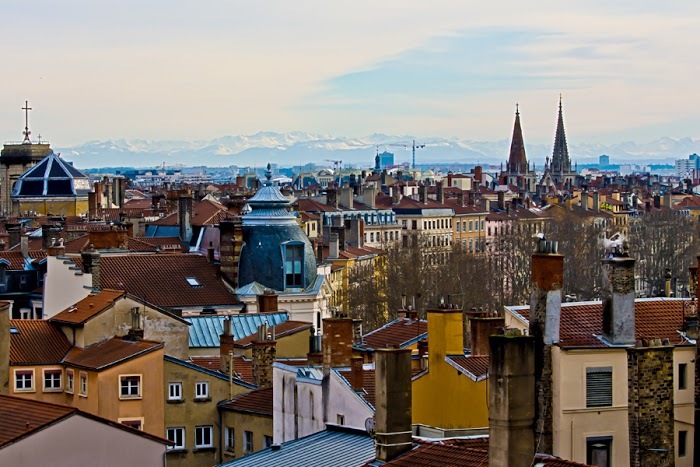 Lyon is often acknowledged as an industrial city, however it is also famous for its Roman district, Presqu’ile, narrow passageways (traboules) and architecture from the 12th century to modern times. All photos in this post are by Richard Moore. French food and wines in Lyon are amazing! Some of my favourites include Tartare de Boeuf (raw minced beef), Eggs Meurette (poached eggs floating in red wine sauce) salade lyonnaise (similar to Caesar salad with a poached egg on top). Red Cotes du Rhone wines with saucisson de Lyon (sausage) and Foie Gras (duck liver pate) are equally incredible. Many French people in Lyon speak English and are generally very nice and helpful. Lyon is slightly less crowded than Paris. You can walk almost everywhere in the town centre and surrounding arrondisements. Visit a typical and traditional Bouchon, a restaurant serving amazing local dishes and wines. Also check out Rue Royale where you can find some other great restaurants. Try my favourite restaurant in world called Cousin Cousine & Co. located at 1 Grande Rue des Feuillants, 69001, Lyon. It’s not for the fainthearted, but the Tartar de Beouf is delicious – and the best culinary experience when served with a Beaujolais or Cotes du Rhone wine. Ride the funiculaire up the 30% incline to the Basilica of Notre-Dame de Fourviere. Explore the Traboules. Traboules are narrow passage ways that join two streets. They are open to the public during the day and give you a wonderful insight to the lives of locals. See the Fountaine Batholdi, in Place des Terreaux, was created by Frédéric Bartholdi, who made the Statue of Liberty in New York in 1886. Check out Rue de la Republique and Rue Edward Herriot for great shopping (sales are in January and July). Rue Romarin and surrounding streets are where you will find eclectic, preloved and new clothes and nik knacks. The Basilica of Notre-Dame de Fourviere sits on top of the hill of Fourviere, on the site of ancient Roman ruins that lay buried beneath its crypt. The view from Fourviere of the city of Lyon is one of the most incredible views of any city. On a clear day you can see the white snow atop the French Alps in the east. Between the red rooftops and chimneys you can clearly see the River Saône and River Rhône joining in a “Y” shape and forming the Presqu’ile (peninsula). The gothic-like cathedral was dedicated to Virgin Mary and built between 1872 and 1884. 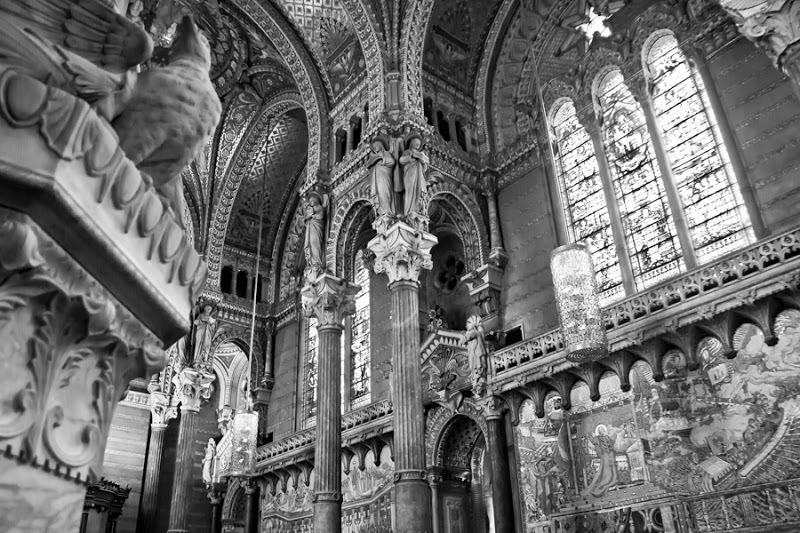 The inside of the magnificent church is decorated with gold flecked mosaics, sculptures and stained glass and sits on top of a large crypt guarded by a Lyon lion. The internal stairwell, between the main cathedral and the crypt below, host a large array of Hail Mary prayers in different languages from around the world, including Maori, Chinese, French, and Arabic. If you are feeling up for it, you can enjoy a wonderful walk down the steep hill and many staircases to Rue Saint-Jean, the main cobblestone street of the Old Town. The Old Town of Lyon is the touristy area on the west side of the River Saône between Rue de la Bombarde and Rue Octavio Mey. This is where you can find lovely cobble stone alleyways, streets and traboules with some amazing restaurants and plenty of people enjoying the sites. Be aware that many restaurants will close during the August holiday period. Pace Bellecour is a large bare, dirt square that forms the central focus of the Presqu’île, between the Saône and the Rhône, in the 2nd arrondissement of Lyon. There is a statue of King Louis XIV in the centre, a tourist information office and an art gallery. During the winter an ice rink is installed here, but throughout the year there are many concerts and events in the square. Parc de la Tête d’Or is a 117 hectare public park located in the 6th arrondissement of Lyon, on the Left Bank of the Rhône. It features a large boating lake, botanic garden with greenhouses, rose garden and a small zoo, with giraffes, elephants, tigers and other animals. There are also sports facilities, such as a velodrome, boules court, mini-golf, horse riding, and even a miniature train. Buses 41 and 47 link it with metro Part-Dieu. The Place des Terreaux, a National Heritage Site of France, is a square located in the centre of Lyon, on the Presqu’île between the Rhône and the Saône and at the foot of the hill of La Croix-Rousse. The square is bordered on the east by the Hôtel de Ville (Lyon City Hall) and on the south by the Palais Saint-Pierre and the Musée des Beaux-Arts de Lyon. The museum includes works by Rodin, Rubens, Rembrandt, Monet, Matisse and Picasso. Nearby the square you can also find Place l’Opera (Opera House) and other beautiful buildings. 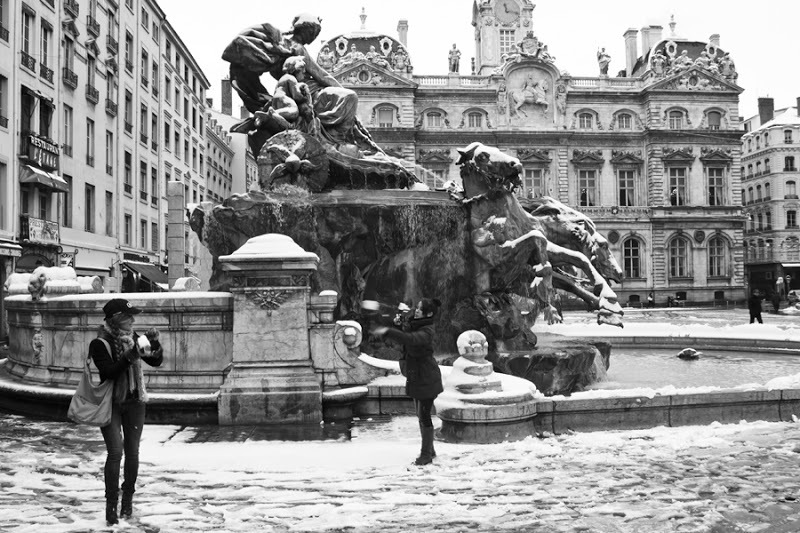 The Fountaine Batholdi, in Place des Terreaux, was created by Frédéric Bartholdi, who made the Statue of Liberty in New York in 1886. The fountain depicts France as a female seated on a chariot controlling the four great rivers of France, represented by wildly rearing and plunging horses, highly individualized but symmetrically arranged, with bridles and reins of water weeds. La Croix-Rousse is the 254m hill to the north of the Place des Terreaux that offers beautiful views across the city. 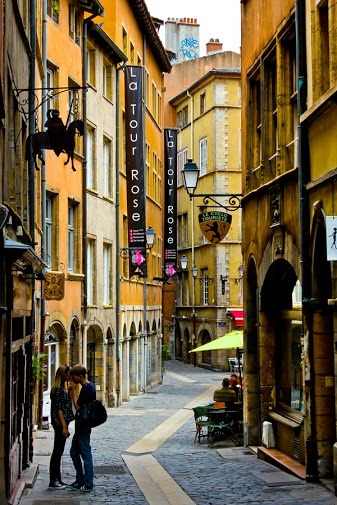 It is located in a district of Lyon by the same name that was known for its 18th century silk workshops. Rue de la Republique is a street that runs north to south from the 2nd arrondissement of Lyon to the 1st. It is the main shopping street in Lyon and is home to luxury shops, restaurants, cinemas and less expensive shops that entice any shopper. 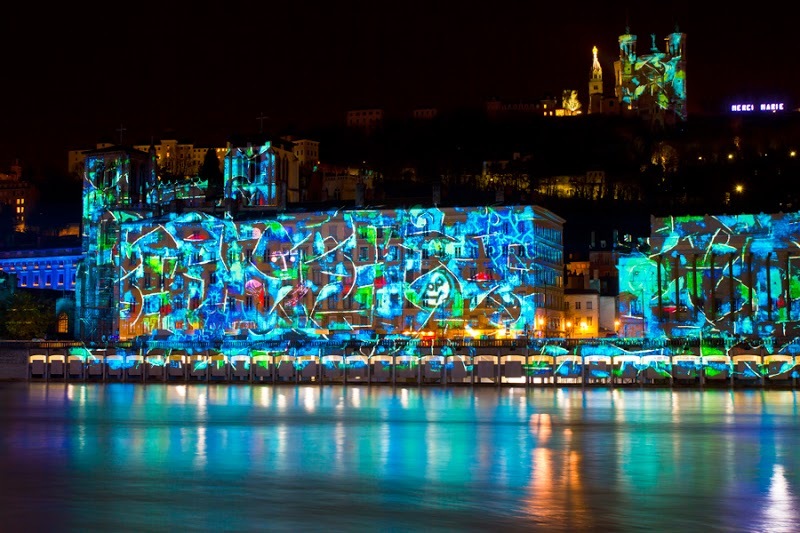 The Festival of Lights (Fête des Lumières) is the largest and most important festivals in Lyon. It lasts four days in early December. From 1852, the people of Lyon spontaneously illuminated their windows with candles to celebrate the inauguration of the golden statue of the Virgin Mary. The Virgin has been the saint patron of Lyon since she allegedly saved the city from the plague in 1643. The festival is now an international event, with tiny installations in remote neighbourhoods to massive sound-and-light shows around the town centre from famous artists around the globe. The Fête des Lumières attracts around 4 million visitors every year, so book accommodation well in advance! The Nuits de Fourvière festival is held from June to early August. International artists come from all over to perform an array of concerts, from popular music, jazz, classical, dance, theatre and cinema, in the Roman theatres. Consists of only 4 Metro lines, 2 funiculaire lines, 4 tramways, trolley busses and normal busses, the public transport system is very easy to navigate. You can purchase tickets from a vending machine at metro and tramway stations. The Lyon City Card allows unlimited access to all Lyon buses, metros, metros, funiculars and trams, free admittance to a selection of museums, workshops and shows, as well as reductions in certain theatres, the opera, etc. You can buy these online. The city centre is not very big and most attractions can be reached on foot. The walk from Place des Terreaux to Place Bellecour, for example, is about 20 min. The rule of thumb is that metro stations are generally about 10 min walk apart. 1-day ticket: €1.50, then free for the first 30 min of each ride, €1 for 30 to 60 min, then €2 every 30 min. Lyon’s Saint-Exupéry Airport (LYS) is 25 km east of Lyon. The Rhônexpress connects the airport and Lyon Part-Dieu station in 30 minutes. It costs €13.50 for a single journey, €24.50 for a return (add €1 to purchase at the station or on board). A taxi to Lyon costs around €40-50 depending on the exact destination. Alternatively, the metro (line A) can also connect you with other parts of the city. Another option is to fly to Paris Charles de Gaulle airport and take a TGV (fast train) to Lyon Part Dieu station directly from the CDG train station. TGV (fast trains) link Lyon with Paris (2hours) and Marseille (1hr 36min) while many other services connect Lyon with other domestic and international destinations. The total journey time from London to Lyon (via Gare de Lille Europe or Gare de Lyon Station in Paris) is approx 5h30m. Trains from most major cities will arrive at either Perrache station or Part-Dieu station in Lyon. Perrache is a short walk from Place Bellecour and generally more handy if you are staying in the city centre. Part-Dieu station is in the heart of Lyon’s main business district. Saint-Exupéry is the train station is outside the city and serves the airport. A6 to the north from Paris. A7 to the south from Marseille, Nice, Spain, Italy. A43 to the east from Grenoble, the Alps, Northern Italy. A47 to the west from Saint-Étienne, Clermont-Ferrand, Massif Central, west of France. A42 to the northeast from Bourg-en-Bresse, Geneva (Switzerland), Germany. Summer: Lyon in August is a very quiet place. Everything, from the local bakery to the Irish bar, are empty or have limited business hours. Many businesses will close down for a number of weeks while the locals disappear to locations unknown. If you do travel to Lyon during August you will probably be lucky enough to enjoy a wonderful Lyonnaise meal at a traditional restaurant that is normally booked during lunch and dinner. In July, the activity is close to normal but the weather may be unpleasantly hot. Average summer temperatures range between 25°C/ 77°F and 32°C / 89°F. Spring & Autumn: May-June and September – October are probably the best times: the weather is usually nice and warm and you can enjoy quite long daylight hours. Lyon in the spring and autumn enjoys a warm climate and cooling evenings. Average spring and autumn temperatures range between 16°C/ 60°F and 24°C/ 75°F. The temperatures drop drastically in November to an average of 10°C/ 50°F. Winter: Between December and February the maximum temperature is only 10°C/ 50°F and the minimum temperature at freezing. Expect some snow and icy footpaths! Consider hiring a car for a few days to explore the Rhône-Alpes region. Vienne became a major urban center when the Romans transformed it into a colony in 47BC under Julius Caesar. Vienne became the Kingdom of Provence and was ruled by several archbishops before they surrendered it to France in 1449. Amazing sites in Vienne include the Roman remains of the temple of Augustus and Livia (built on a sacred area around 20 to 10 B.C), La Pyramide, the archaeological gardens of Cybele & the Vienne Theatre and the very gothic Saint-Maurice cathedral. There is a wonderful tourist path around the town that guides you through the small town to each of the tourist sites where you can find a panel of information to read (in English and French). You can even pick up an audio guide from the local tourist office which provides you with a little more information than the panels on the walk. 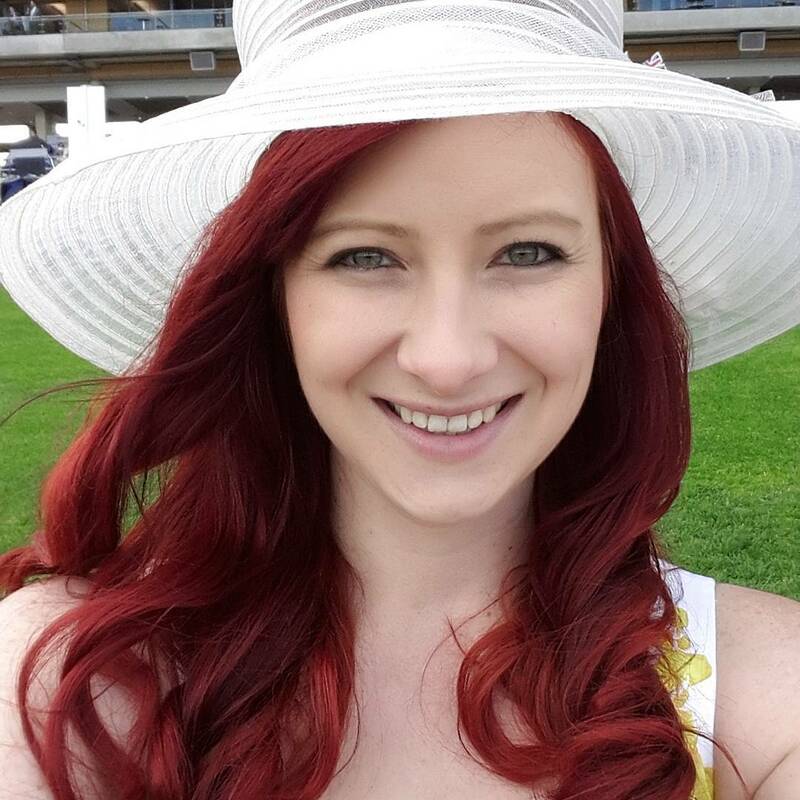 Check out my recommendations on what to do in: Amsterdam, Bali, Berlin, Brisbane, Budapest, Cambridge, Canberra, Cappadocia, Chamonix, Copenhagen, Dubrovnik, Istanbul, Kotor, Kyoto, London, Madrid, New York City, Paris, Riga, Scotland,Tokyo, and Washington D.C.